Let's say you picked up a classic that hasn't run in 12 years (make/model doesn't matter, pick one). Everything needs attention, suspension, brakes, steering, engine, transmission, interior, paint, etc. In what order would you repair/replace major areas? Are there any spreadsheet type lists/checklists you have found useful? Specifics now. I purchased a '70 Corvette coupe, automatic with base engine. Numbers match, but it will be getting a 5 speed and I'll most likely pull the original engine and keep it safe while installing an aluminum headed generic 355 maybe a 383 stroker. No other firm plans at this point just assessing the damage (some rust repair in the windshield frame so far). I'm on restoration number 3 and I will tell you what has worked for me. No idea if it is correct or not. I start by stipping the car entirely, or as far as you are going to take it. I label and box everything and take pictures of every task before disassembly. I tackle the bodywork next and then send it to the paint shop. At this point, I may have done the suspension. I've done it both ways and didn't notice much difference. While the body is away, I do the motor and other mechanical parts. When the body returns, I rebuild the brakes by starting the master cylinder install and go from there. Then I reinstall the motor and mechanical bits, the interior, and then the exterior pieces last. Like I say, not sure if it is correct, but it's worked for me. 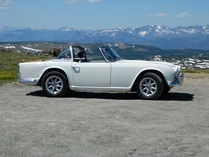 I've got a 63 triumph tr4 that's getting a budget makeover. The bodywork is getting attention first - mainly because it's going to take more time than the mechanical end of things. While the body parts are still off the car, I'll go after the mechanical bits. They will be more accessible and I won't have to worry about screwing up new paint. Once it's working, I might pull the engine out and redo the engine bay and clean up the eng/trans. Not planning on pulling the tub off the frame at this point - but you never know when the "might as well" bug hits (and the bug that can instantly multiply your restoration costs). Definitely use baggies and photos for parts/bolts. You think you'll remember how things go together...you won't.